Showing 15 articles from June 29, 2013. The Party for the POOL fundraiser is Saturday, July 20th at the Raymond Elks from 5:30-9 p.m.
Editor’s Note: Honor Roll is for students with a 3.20 to 4.00 grade point average; * - denotes 4.0 gpa. Honorable Mention status is 3.00 to 3.19 gpa). Why do you tolerate a 72,000-page tax code and an IRS that spends tax dollars on lavish meetings and hotel rooms and targets groups for political reasons? Patriots 4-H Club member Marissa Rohr and her horse, Chief, prepare for last year’s Open Trail Challenge. 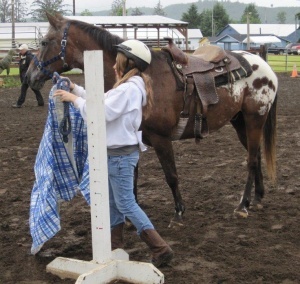 The Pacific County 4-H Volunteers will be hosting the Second Annual “Open Trail” Challenge July 13th as a fundraiser for local 4-H Horse groups. Boat Owners Association of The United States (BoatUS) says this July 4th holiday week will be a doozie for America’s recreational boaters. Editor’s Note: Thursday, U.S. Senator Maria Cantwell (D-WA) released the following statement after the U.S. Senate cast a bipartisan vote to pass the comprehensive Border Security Economic Opportunity and Immigration Modernization Act. Cantwell voted in favor of the bill, which now moves to the House for consideration. Editor’s Note: Last Thursday, U.S. Senator Patty Murray issued the following statement after the Senate passed historic, comprehensive immigration reform legislation by a vote of 68-32. The Labor Day Committee is hosting Sand Bucket Bingo Friday, July 12, 6 p.m., at the Community Center in South Bend. There will be 20 games and the prizes are sand buckets full of fun summer toys. The cost is $7.50 to play three cards all night long. The first LPSS Schwingfest was held in 1964 and the Swiss are still Schwingen in Frances, today! OLYMPIA – County unemployment rates and employment data for May 2013 were released this morning and are posted online at www.esd.wa.gov/employmentdata; click “Statewide and county detail” in the “Current unemployment rate” box.